For me, like many people of a certain age, world events of the 1980s were accompanied, on television and sometimes on radio, by a sensible Englishwoman with an unidentifiable accent and a flat, clipped and precise delivery. 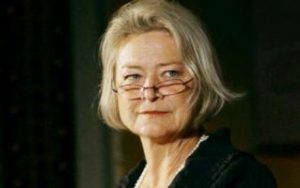 The Tiananmen Square protests, the Lockerbie debris, disasters, wars and other momentous events happened and they happened just behind where Kate Adie was standing. I remember her, Chief News Correspondent for the BBC, wearing flak jacket, in fur-lined parka and with that sort of canvas hat which people wear to sunny cricket matches. She covered the Falklands War, the Gulf War, ethnic-cleansing in the former Yugoslavia and Rwanda, the Herald of Free Enterprise disaster and the U.S. Bombing of Tripoli (from Tripoli). That report prompted Norman Tebbit to accuse the BBC of bias, though he didn’t name Adie, she was too much a ‘national treasure’ in waiting and, it is said, notoriously litigious. 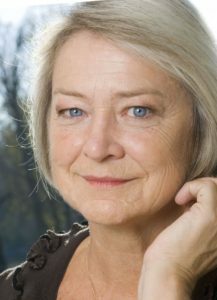 British Army squaddies used to jest that they knew they were in trouble when Kate Adie turned up and it was said that the best place to be in a war zone was on the plane which had brought Kate Adie into a country, when it was leaving. She has been shot once, in Libya and injured once, in Bosnia. 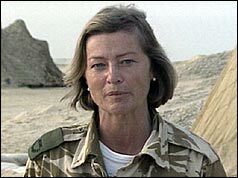 She stepped back from front line reporting in 2003, though she stayed on at the Corporation to revitalise Radio 4’s From Our Own Correspondent and still presents the show today. She has received numerous national and international prizes and honours and was awarded the OBE in 1993. She is also a best-selling author, with her auto- biography The Kindness of Strangers (Headline, 2002), Corsets to Camouflage (Hodder, 2004 ) which examines, in association with the Imperial War Museum, women’s role and image in war and Nobody’s Child (Hodder & Stoughton, 2005) a study in what it is like to be an orphan. Adie was, herself, adopted and, while she is on record as saying her childhood was happy, she has also sought out her birth parents. 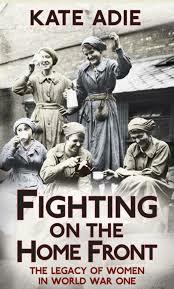 Her latest book is Fighting on the Home Front; The Legacy of Women in World War One ( Hodder, 2014). In it she charts the seismic move towards equal rights with men that began a century ago and shows just how momentous the achievements of those pioneering women were. In 1914 the world changed forever. When World War One broke out and a generation of men went off to fight, women emerged from the shadows of their domestic lives. A visible force in public life, they began to take up essential roles – from transport to policing, munitions to sport, entertainment, even politics. They had finally become citizens, a recognised part of the war machine, acquiring their own rights and often an independent income. 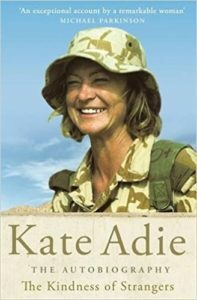 Kate Adie will be discussing this book and others, in conversation with BAFTA-award winning Simon Bershon, as part of the Clapham Book Festival at 7.30 p.m. on 6th May at Omnibus, Clapham. There are still a few tickets left, but, if you want to come along, buy your ticket soon, they won’t last long.